Who knew that comic books would be one of the main items in the list of human evolution? While Lev Gleason Publications is correct, comic books are here to stay (!!! ), Lev Gleason Publications would not be a publisher that would survive the arrival of the Comics Code. In fact, Gleason's popular Crime Does Not Pay would be instrumental in getting the Comics Code established along with EC's horror and crime comics. 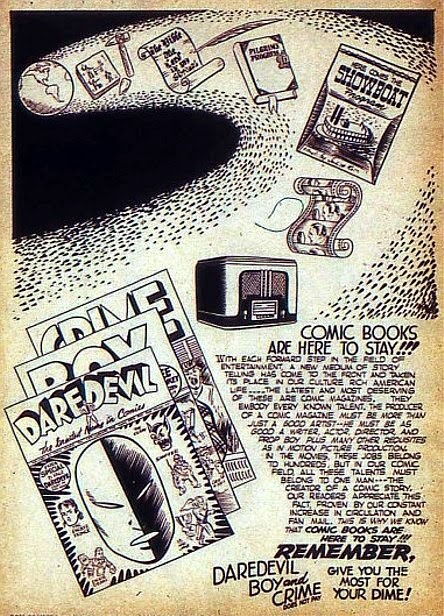 The three comics mentioned in this ad were three of Lev Gleason's most popular titles. Daredevil Comics began in 1941 and the first issue was actually called Daredevil Battles Hitler and was renamed Daredevil Comics with the second issue. Daredevil Comics was an anthology series named after the featured character, Daredevil. Eventually, Daredevil got a group of kid sidekicks called The Little Wise Guys who eventually dominated the series and soon squeezed out Daredevil who made his last appearance with Daredevil Comics #70. The series would end with #134 in 1956. The second but first issue of Daredevil Comics. The final issue of Daredevil Comics. Boy Comics initially began as Captain Battle Junior in 1943 but was given a name change with the third issue. Boy Comics was, again, an anthology featuring superheroes that were all boys. The main feature was The Crimebuster who was Chuck Chandler avenging his parents death at the hand of the Nazis. Lev Gleason writers really milked the Nazis for story ideas. The first issue of Boy Comics, #3. I guess I should mention that Chuck Chandler had a pet monkey that would join him both on adventures and just in his life. As superheroes fell out of fashion, stories started focusing more on Chuck at school and not fighting crime. For some reason, Crimebuster's arch-nemesis, The Iron Jaw--who killed Chuck's parents by the way, stuck around but became comic fodder and covers showed The Iron Jaw dangling from scaffolding, getting his fortune read, being trapped on a roller coaster and generally just being a idiotic stooge. Starting with #107, the Comics Code cracked down on the use of the word "crime" so Chuck, or Crimebuster, just went by C.B. and he ditched the costume. Boy Comics came to an end with #119 in 1956. The final issue of Boy Comics. Crime Does Not Pay began in 1939 as Silver Streak Comics. Silver Streak initially starred a villain, The Claw, who was created by Jack Cole of Plastic Man fame. After #2, The Claw was put aside to debut the superhero Silver Streak, who was the second speed-based superhero. The Claw returned in #6 and proceeded to do battle with Daredevil in #7. Silver Streak was quickly pushed aside for constant battles between Daredevil and The Claw until Daredevil got his own title but Silver Streak would never regain his title as with the outbreak of World War II, Silver Streak began featuring Captain Battle and then The Saint. Silver Streak Comics wouldn't last long and would become Crime Does Not Pay with #22. Crime Does Not Pay was a true crime series, the first of its kind, that glorified and sensationalized real crimes and real criminals. When Mr. Crime was introduced in #24, he was your faithful narrator much like The Cryptkeeper would become for EC but Mr. Crime both praised and condemned the crimes so he was not one to lecture the kids reading this comic. As Congress cracked down on comics and publishers began censoring themselves and established the Comics Code, Crime Does Not Pay sanitized their stories and all the criminals got what was coming to them. The new CDNP lasted only a few issues before ending in 1955 with #147. The final issue of Crime Does Not Pay. This comic is ironic in that if I were to show your average person a picture of Brutus, they would probably not know who he is. Brutus is no Charlie Brown, Calvin or Mickey Mouse. I hope we see some early strips either here or on GoComics. It would be cool to see some strips from the beginning when there was no main character.